Sales people have to be good at many things if they are to be successful. They need to be evangelists, counselors, engineers, teachers, politicians, project managers, lawyers, leaders and servants. Yet amidst all these attributes there is one skill that defines a star performer... their ability to conduct stealthy research to identify and then engage the power-base within an organization. There is no value in being able to lead with insight if you are talking with the wrong people. If you are in business-to-business selling, then LinkedIn is the most powerful database and engagement tool in your arsenal. You know that your potential customers judge you based on the insights you bring and the questions you ask; but before you get to ask your prospect any questions you must first ask the right questions within iterative and Boolean search. This is because research and search are synonymous in achieving results by finding and connecting with the right people. When it comes to being a master of search there is no-one better than a savvy recruitment consultant and the video below is by Glen Cathey, author of the Boolean Black Belt blog. Strap yourself in and take notes as there is much to learn in how to use LinkedIn's Advanced Search and Saved Searches. LinkedIn's Advance Search is powerful for those who are adept but which version of LinkedIn do you need to be able achieve your sales goals? Those on the free edition of LinkedIn are subject to commercial use limits which restrict searches and profile views for prospecting or recruiting. But even the free version allows users to view the full names and profiles of anyone in their extended network (1st, 2nd, and 3rd degree) regardless of whether they are directly connected or have a Premium account. Usage limits for search on the free edition are triggered when LinkedIn's algorithm deems that someone is using LinkedIn for commercial use such as recruiting activities or prospecting. This limit is calculated based search activity since the first day of each calendar month. When 30% of your monthly searches are left, a progress bar appears in your search results and continues to remind you of how you are tracking against your allowance. You can still use search within LinkedIn even once your limit is reached but you see only a limited number of results. Your limit resets at the beginning of each month. The limit does not however affect searching 1st degree connections. The overall value proposition in paying for LinkedIn Premium, Business Plus and Sales Navigator is therefore in having larger access to the 380 million members and greater search capabilities. Although LinkedIn Premium subscriptions are designed primarily for job hunters and networking purposes, the search capabilities work well for sellers. LinkedIn Premium licenses do not offer relationship management and have limited features which is why Sales navigator is best for sales people. Sales Navigator Team is specifically designed for enterprise teams connecting the world's buyers and sellers. Navigator offers the sales and marketing professional a business planning solution including: expanded access to the network, saved leads and accounts, saved searches, unlimited premium filters, monthly bank of InMails and network unlocks. Importantly, the enterprise (employer) maintains ownership of all user licenses and receives usage reporting plus access to LinkedIn consultants and the learning center. But regardless of the version of LinkedIn you're using, free or a paid, search can transform the way you do social research to target prospects, monitor for trigger events and sell in the most efficient way possible. 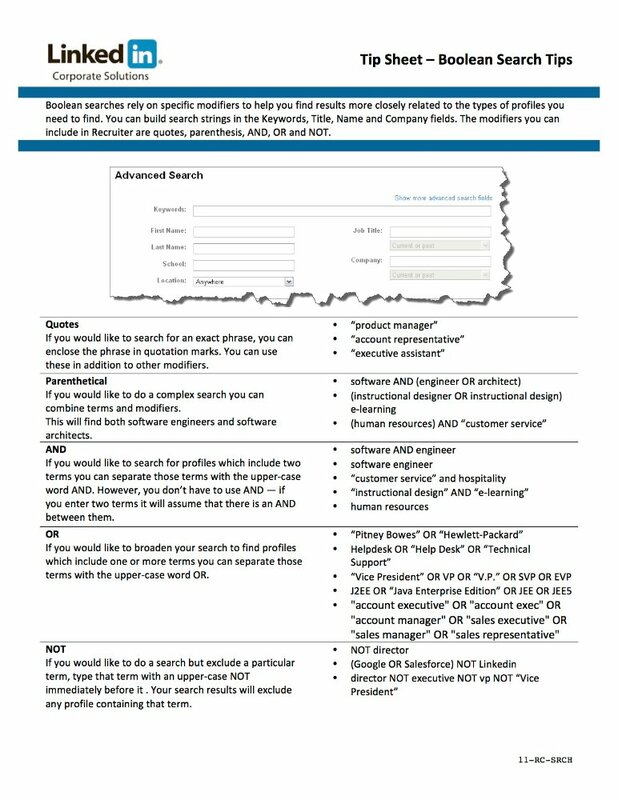 Adam Nash from LinkedIn provides great tips here on using Advanced Search with AND / OR Boolean search terms. The cheat sheet below from LinkedIn themselves is also a great resource. What are your techniques for being a social selling ninja? How do you use search masterfully? Let me know by making a comment. Main image photo from Flickr: Ricky Romero Ninja!